​Grandmaster Cook has been teaching for over 30 years. He is a 7th Degree Black Belt in Karate, a Grandmaster of Ninjitsu and Chinese Kung Fu, a Doh-Yi Master, and a Professor 9th Degree Black Belt in the Pierce Family Kung Fu System & the Black Dragon Fighting Society. In 2005 he received one of the most knowledgeable masters awards from the Martial Arts Hall of Fame and was put on the International Grandmasters Council. Grandmaster Cook has won over 50 martial arts championships and has 165 traditional Chinese Kung Fu forms to share with other martial artists. Master Cook has schools throughout the United States, Mexico, and Canada, has certified hundreds of Black Belt Instructors. 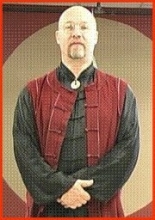 He has produced dozens of books and videos in the arts, and specializes in teaching Black Belts exotic forms and weapon systems. He has learned from some of the greatest teachers of all time and enjoys sharing that knowledge with others.